The first batch of December, already long gone. Chop chocolate and place in a large bowl. In a saucepan, heat cream until it reaches its simmering point and pour over chocolate. Stir chocolate and cream together until you have a smooth paste. Add flavoring if you like some. For me, the pure plain choco taste is always enough, but I may sometimes use cayenne pepper for a kick, or a little bit of vanilla bean powder and sea salt, or even finely grated zest of organic orange. Cool mixture in the fridge for a few hours. To shape the truffles, dip a melon baller or a round spoon in hot water and scoop up balls of the chocolate mixture. You can also use your hands to roll the truffles. Do not trouble yourself and aim for perfect rounds, though, the uneven earthy shape is much more charming. Coat truffles after shaping. Dark cocoa powder is a classic, but crushed almonds or pistachios make a nice top layer too. One Christmas I coated my dark chocolate truffles with two layers of white chocolate and that turned out a success. People liked the joyful sweetness of white chocolate combined with the more intense and bitter dark chocolate heart. 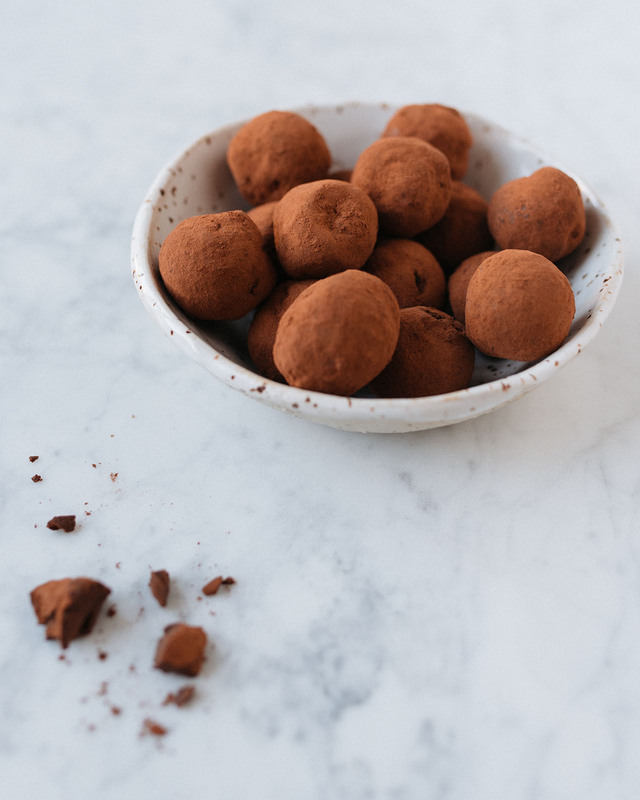 For chocolate coating, you will need roughly 100 grams (3,5 oz) of chocolate for ten truffles. Melt chocolate, and let cool slightly. With a fork, pick up one truffle at a time and spoon melted chocolate over the truffle until well coated. Place coated truffles on a baking tray and chill. For a thicker coating, simply go through the same process twice. Store truffles in a closed container in the fridge.